After squinting at and studying the female witchdoctor concept art for a few weeks, I finally felt sure of what kind of fabric it was I was looking for. Mario and I made a trip out to our local JoAnns, and proceeded to wander around with our cellphones out and the picture up, holding up the picture to every reddish fabric we could find. We decided that it needed to be a good stretchy fabric that would fray and rip nicely, and it didn’t take us long to find it. We only got two yards because really, the costume doesn’t call for a lot of fabric. We also got leather lacing in the same color (lucky for us that it matched so well! ), some beads that looked like they were similar to the one in the picture, and a button/claw thing that looked like a tooth that isn’t in the picture, but would help secure the skirt onto me so that I wouldn’t have to worry about anything falling off, since the leather lacing is kind of hard to tie (and would be bulky under the skirt anyway, and I didn’t trust a simple clasp to hold this heavy skirt up. 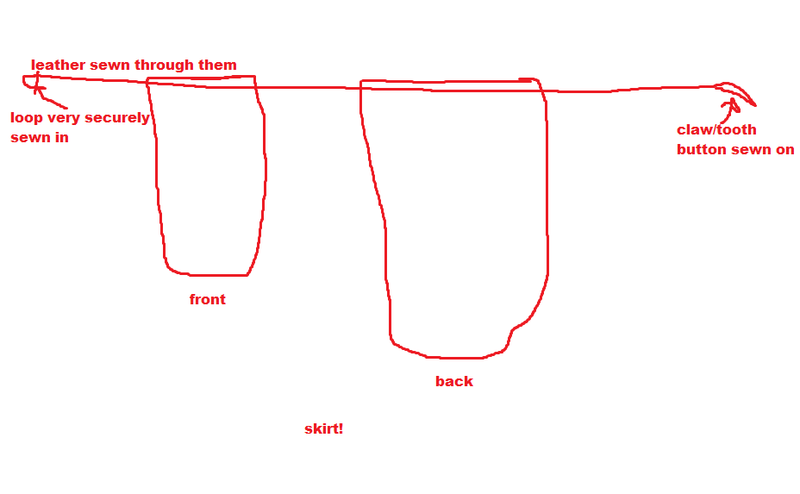 I measured my bust, right under my bust and the length from the bottom of my bust to the top of my neck, and then around my hips where the skirt would be sitting. 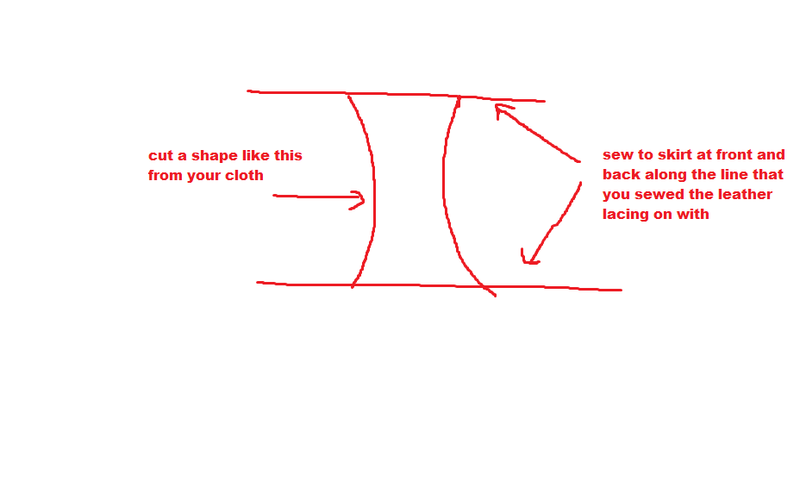 I made a basic triangle shape for the …shirt?, added enough fabric at the ends to be able to fit around under my chest snugly, and made sure there was enough fabric at the bottom part of it to be able to cut and fray to get the right look. 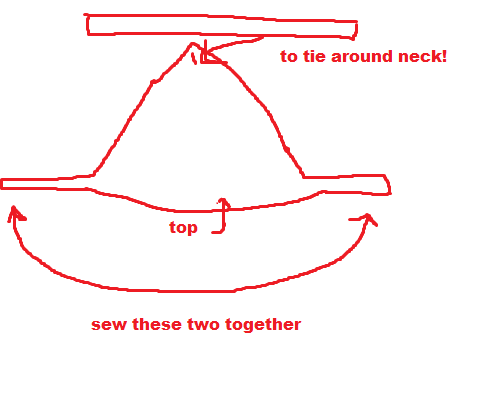 Then I cut a slit in the top of the shirt, and threaded a length of the cloth through it, to tie behind my neck since nobody will see that part under the collar. I then sewed the two long pieces at the bottom together, making sure it would be tight on me (and tight in the right spot so that the triangle part would cover my chest). (Click on the image to make it larger!) With the skirt, I just measured how wide I wanted it to be on my front and back half, and how long I wanted it to be. I cut the bottom part of the skirt pieces kind of erratically, since I would be fraying and tearing it anyway. Oh, and I actually tore the sides of the skirt straight down, they weren’t cut. I then folded the top of the skirt around the leather lacing, pinned it and sewed a straight line across under it. (I also made sure to add the beads to the lacing that are there in the picture before we completely closed it off.) We took a heavy needle and (with a lot of time and thimble using) made a loop with one end of the leather lacing, making sure that it was big enough for the tooth button to fit through, but not large enough for it to come loose without trying. We then sewed the tooth button to the other end (after obviously making sure that the length was perfect and sat where it needed to) and the skirt was almost done! To fray the bottom, I held it taut while Mario went at it with a pair of really sharp scissors, making a few incisions along the bottom and also scraping the scissors along the fabric to make it fray nicely! And the back! For the beads, I used the leather lacing again, and did two layers of beads, with some strands of beads hanging off of them as well. I tied each end securely onto the lacing that was attached to the skirt, and I never had a problem with them falling off! I hope that was helpful, and please let me know if you have any questions! I’ll be posting on how I made each piece of the costume over the next few weeks, so stay tuned! 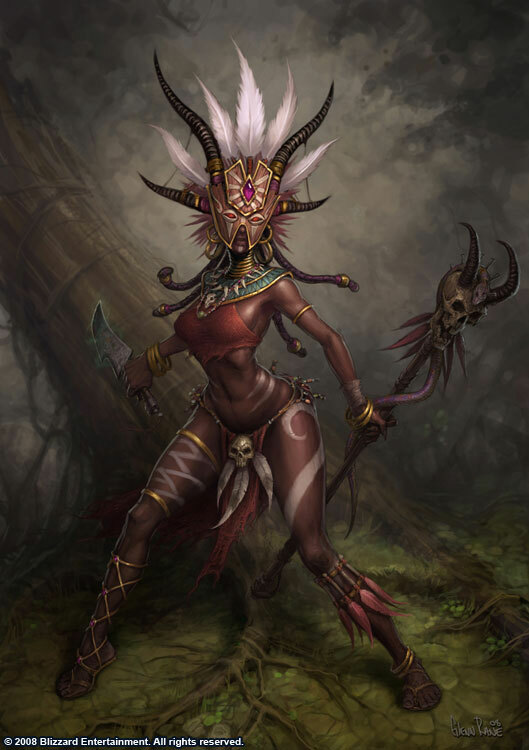 This entry was posted in Cosplay, Tutorial and tagged blizzcon, concept, diablo 3, female, how to, tutorial, witch doctor. Bookmark the permalink.